Cumulus convection is a major player in thermodynamic changes to the atmosphere. We study the physics of moist convection, from stratocumulus and cumulus humilis to towering cumulonimbus clouds. 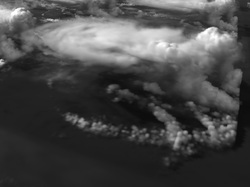 Increasing our physical understanding of moist convective processes can lead to improvements in cumulus parameterization for climate modeling, as well as in numerical weather prediction. Our group has made progress in this field through analysis of a Large Eddy Simulation (LES) of deep convection known as the GigaLES. In particular, former group member Peter Bogenshutz used the GigaLES as a benchmark to evaluate and test a new turbulence parameterization known as the Sub-grid-scale Higher Order Closure (SHOC). The images to the left are visualizations of the cloud water and ice concentrations in the simulation, made by group member Ian Glenn. The radiative transfer program known as SHDOM by Frank Evans was used to calculate how light would scatter through selected 3D volumes of liquid and ice particles taken from the GigaLES. The colorized image below is stereographic and can be viewed in 3D by crossing your eyes and moving your head slightly back and forth. A cold pool is a region of cold, dense, high pressure air that is observed to form beneath a thunderstorm or squall line. The relationship between cold pools and cumulus convection is an active area of research in our group. 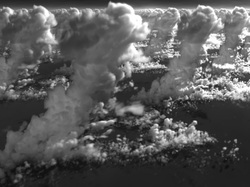 Do cold pools affect the organization of cumulus convection? Can properties of the cold pool measured near the surface be used to diagnose the properties of the convection aloft? 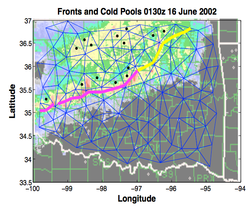 To this end, group member Andrew Lesage performed extensive analysis of Oklahoma Mesonet observations. By defining a triangular matrix over the observation area (illustration to the right), Andrew was able to diagnose the presence of cold pools in the region. Using almost 15 years of observational data, he compiled a cold pool climatology that will lead to an increased understanding of the interactions of cold pools and convection. Entrainment, POST and Sam's work, also the earlier UULES work? Adam and Mary Ann's work.